Three months after buying our new van and….WE LOVE IT. Seriously, I am already utterly in love with the thing and we haven’t even converted it yet. But why a conversion update then, you may ask? Well, there has been progress of some kind that I would like to share with you. We’ve had a bunch of people asking us questions both online and offline about the van so it’s also incredibly handy to write a little update and answer everything in one place. Being that this Savana van is the biggest investment either of us has made (ever), we are not taking the conversion lightly. 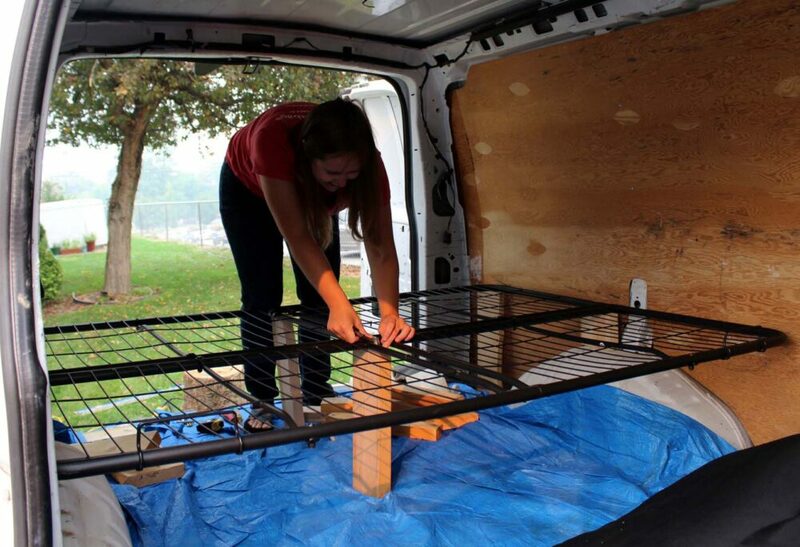 It will be a slow, careful design and construction process to build the best van for long-term living. The planning is happening now and the building work over winter. For now, though, we still need a van we can travel around and sleep in while the weather remains good. So a temporary bed was an essential. But it had to be cheap, simple and work well. The solution turned out to be exceptionally easy. 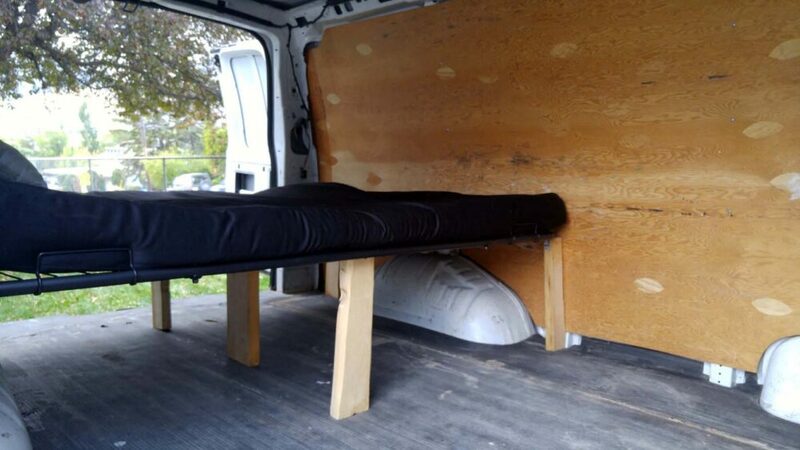 Our basic Walmart futon (three years old) fitted into the back of the van perfectly. And when I say perfectly, I mean with not a millimetre to spare. That futon is positively wedged between the walls and wheel wells. It is held up by some offcuts of wood given to us by some RV travellers while camping at Vaseux Lake earlier this year. 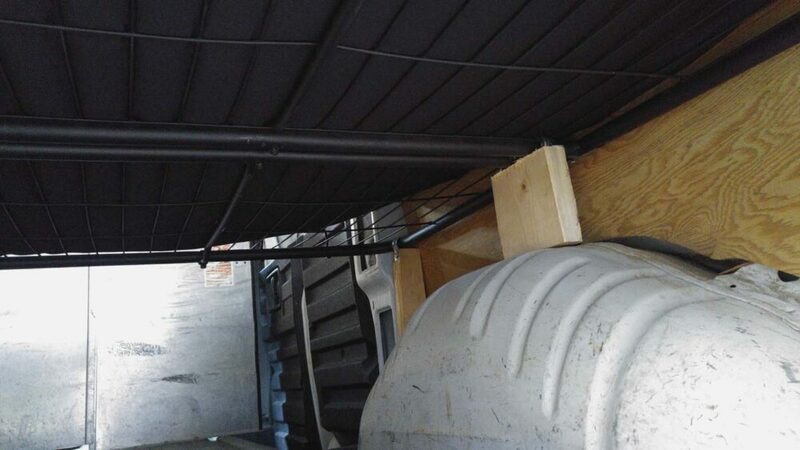 The metal frame of the futon is attached to the wood with some leftover electrical brackets that came with the van. 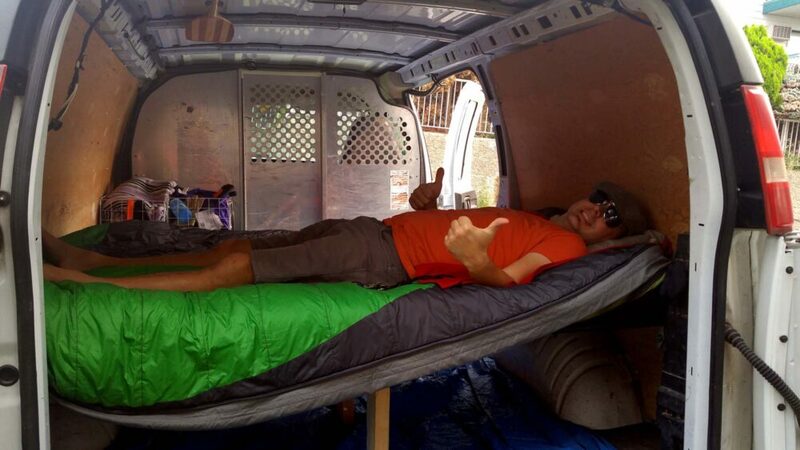 The cheapest temporary van conversion ever?! We may not be actually living in our Savana full time yet but it’s easy to get a feel for how it will be in future. I can tell you one thing already for sure; it will be a massive improvement from life in the Astro Van. The Savana may only be a little bit taller, wider and longer than the Astro yet the impact on living will be substantial. The extended width is such that JR can actually sleep comfortably across the van. In the Astro, he ended up sleeping more diagonally due to the width being 5″9 and his height being exactly 5″9. Turns out that it is nice being able to stretch out properly! There is SO much space between our temporary bed and the front seats. We could almost fit another full size bed there. Not having any windows in the back is an unexpected bonus. No dealing with curtains or blackouts plus it’s way more stealthy for wild camping and no doubt safer too. 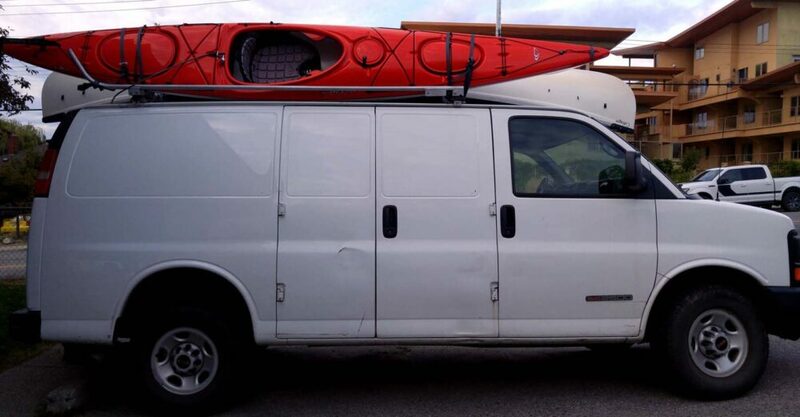 Our two kayaks and canoe fit PERFECTLY on top of the roof rack! The curved front of the roof rack is also ideal for sliding the kayaks on and off easily. The back doors open properly even with the canoe on top of the vehicle (they never did in the Astro). The partition that came with the van is another surprise advantage. Having a separation between front and back is both convenient and practical. Everything that belongs in the back, stays in the back. We also haven’t had to add any curtains or blackouts to block the view from cab to ‘bedroom.’ The door in the partition makes it easy to move between front and back. In three months, we have driven just over 3000 kilometres in the Savana to the Sunshine Coast and the Kootenays. 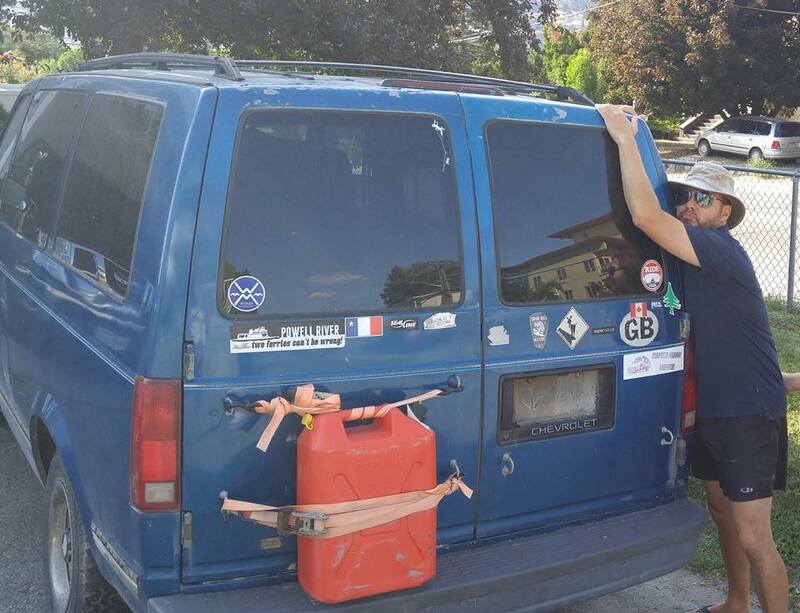 The gas mileage is actually a little bit better than the Astro Van. So the Savana is bigger yet more fuel efficient. Hooray! Being a vehicle with Rear Wheel Drive (RWD), the Savana drives quite differently than our All Wheel Drive Astro did. We took it on some (particular challenging) logging roads in BC’s Kootenays region and it was a weird driving experience. It felt like a much rougher ride and the Savana had a tendency to slide around some corners. We will be getting better tires soon which may help a little. With additional height and also increased clearance, the Savana is HIGH. Tying and adjusting the kayak and canoe straps can be difficult. We’re going to have to buy a step stool of some kind and potentially also a small ladder for the back of the van. As an ex-workvan, there is very little current insulation compared to what we were used to in the Astro. We need to put some insulation in as a priority! Selling the Astro was hard. Not the actual task of doing it, more the letting go part. “Big Blue” had been a huge part of our lives for over five years, taking us all the way to the Arctic and back via so many amazing adventures. Being our former home for five straight months, selling the Astro was more personal than a regular vehicle. We procrastinated for a long time but finally advertised it on Kijiji and Castanet in mid-August. With over 360,000 kilometres on the odometer, we weren’t sure how difficult it would be to sell. As it turns out, it was very easy. 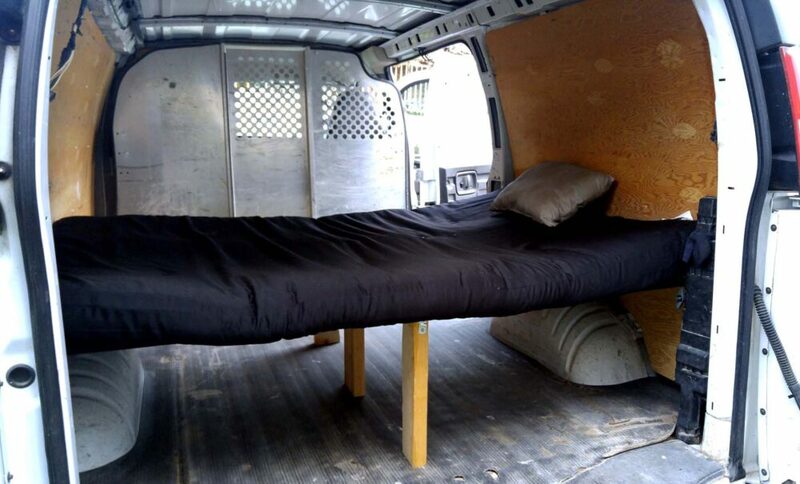 We had plenty of interest and the first person who viewed the van also purchased it. 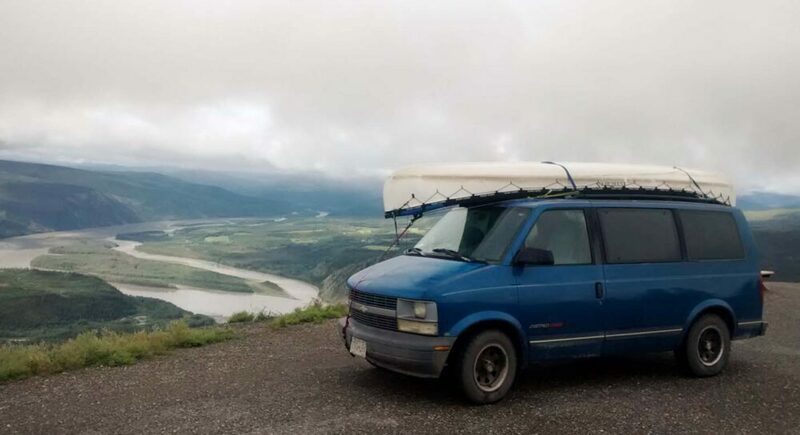 My dream van selling scenario came true: it was sold to an Australian couple, wanting to explore Canada as part of their working holiday. So Big Blue is still out there, exploring more of Western Canada as I type. As mentioned above, the ‘real’ conversion is happening this winter. The planning though is in full speed right now. At least two evenings every week are spent measuring different areas of the van, drawing layouts and comparing design features on Pinterest. Yep, JR has actually become Pinterest obsessed. 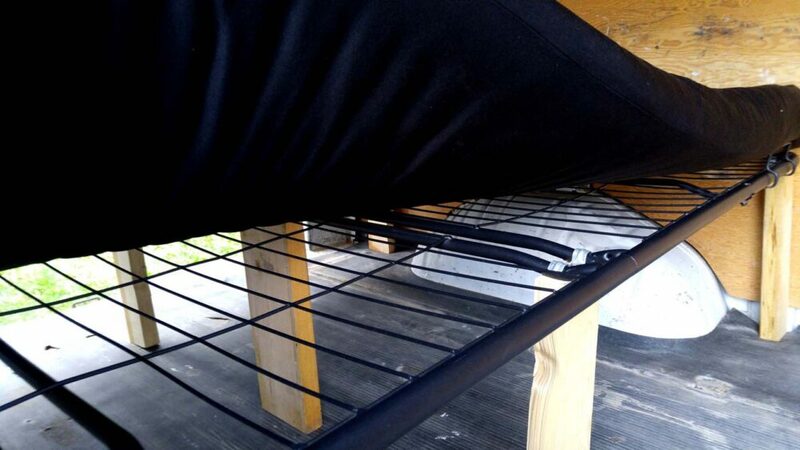 The one part of the design that is firmly decided is the location and size of the bed. 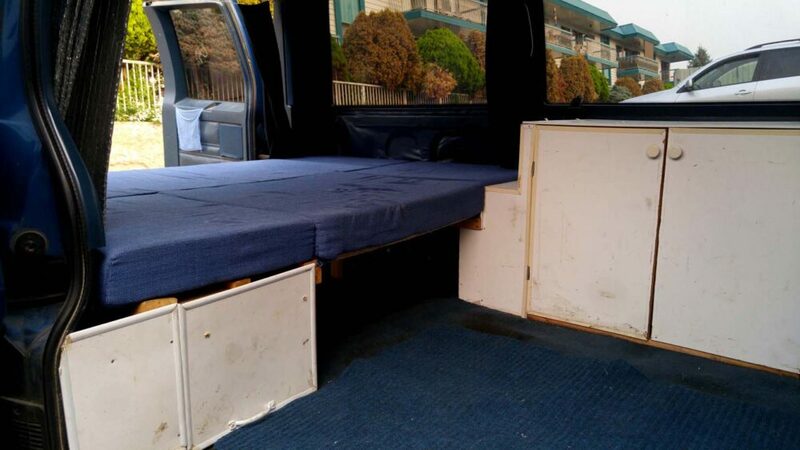 It will be almost the same as the temporary bed, located right at the back of the van above the wheel wells. The height will also be approximately the same with just enough space to sit up properly. We just bought a new (well, not ‘new’, just new for us 🙂 ) 4WD that we need to make some adjustments to so I can totally understand your excitement! Good luck with the design and built of it!